These days, more and more brides-to-be are deciding to have colored birthstones on their engagement rings to go with the customary diamond. It’s a fresh, meaningful, sentimental, and very personal take on this piece of jewelry that symbolizes commitment. Let’s take a look at some of the best reasons couples give for incorporating birthstones on engagement rings. While a diamond is undoubtedly beautiful and is expected to become an heirloom for its durability and timelessness, many couples feel that adding a splash of birthstone color, gives it a more personal meaning. Gems with bright, bold hues such as sapphires, rubies, and emeralds exude warmth and personality. People who know and love the precious stones representing their birthdays and anniversaries seem to naturally gravitate towards the color of these stones for their clothing and other possessions. An engagement ring bearing a birthstone to complement the traditional diamond celebrates the color and meaning that come with it. When Jessica Simpson got engaged to Eric Johnson a few years ago, many took note of her dazzling and very non-traditional ruby gemstone and diamond engagement ring. 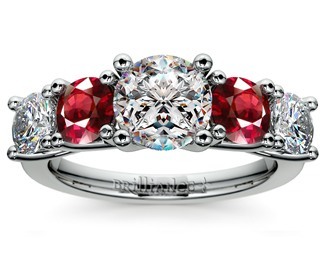 It featured three precious stones: a large ruby in the middle, with two diamonds flanking it. Many wedding speeches uttered between a bride and a groom have to do with blessing the day the other was born. A sentimental and significant gesture would be to combine the couple’s birthstones on one ring to emphasize that two lives are now joined together for eternity. 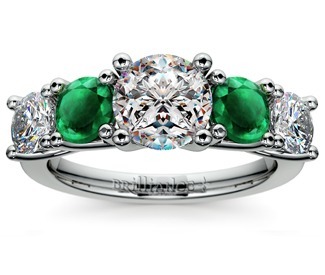 Emeralds paired with garnets, sapphires with diamonds, a ruby with a topaz, and other combinations of precious stones can really add significance to the engagement ring you will be wearing. It is best to consult with an expert jewelry maker to get the best settings for your birthstones so that you end up with a ring that is not only eloquent, but utterly aesthetic in every sense, as well. Apart from their respective birthdays, a couple can have plenty of milestones to celebrate together. Birthstones have their own months to represent, so they can become colorful “markers” on an engagement ring which can act as a timeline leading up to the big day. If you want to do this, think back on the day and month of your first meeting, first kiss, the day of your proposal, your anticipated wedding date, and other important milestones you share as a couple. It will take time and a lot of effort to execute, but once you get it custom made, you will have on your finger an engagement ring that nobody else has because it is truly yours. Even prominent couples have integrated birthstones into their engagement rings. For his lovely future bride and future First Lady of the United States, JFK presented an emerald ring surrounded by 2.88 carats of diamonds when the latter proposed to the former. It was speculated that the emerald represented the month of May, the very month when they were first introduced to each other at a party.